I continue to marvel at how God reveals himself through the minuscule, seemingly “meaningless” things. Well, her first ever “friend” party had to be postponed, and dirt cake was the last thing on my mind, (I have enough dirt on my floor lest I create some unnecessarily), that was, until I arrived at a fabulous yard sale. Had I ever? Well, I about hugged and squeezed off her little neck in excitement, graciously stole it from her for a mere $0.50, and skipped on home. Entering the door, my daughter was beside herself because this meant that a real life friend party was actually coming to fruition. I marvel at how the Lord ministered to me through a little old flower pot. How hard can a dirt cake be to make? Not hard at all. It’s so simple and has such great visual impact that I recommend it for every birthday party, except for the fact that my daughter requested a dirt cake made out of ice cream. And every single recipe that I googled featured only pudding and cream cheese, so I improvised…which is what I am known for. Now its official title is Dirt Soup, but I’ll know for next time that the freezer is a good thing. And yes, we still had candles. (This is the traditional recipe. I will highlight how I changed it to suit my daughter’s request). Crush: 1 large package Oreo cookies in blender. Place Cool Whip lid in bottom of clean 8-inch flour pot. (Umm, I missed this line…huge mistake. I tried sticking some gummies into close the hole after the fact…don’t laugh. You are at Balancing Beauty AND Bedlam). Layer cookie mixture and creamed mixture alternately, ending with cookie mixture on top. Garnish with artificial flowers and serve with a garden trowel or, layer in a sand bucket. Place shovel in the middle or towards the side. Have gummy worms “crawling” out of the dirt. Make sure you end with cookie mixture. I just found flowers that I had in my home instead of purchasing special ones. Yes, a wire cutter would have been nice for those long stems. I’ll be on the look out though for some cute ones for next time. And yes, now my other daughter wants this next year. Enjoy this dirt cake…it’s all about the delicious memory. Dirt cake is so much fun. A great treat for a "spring" party, too. I like to serve in individual cups. I'll have to try this! You're a great mom!!! I remember the very first time I made this cake for a group of kids at our church over 20 years ago! It was a huge hit! I see it still is!! My kids love dirt cake. In fact, they love to get the dirt sundaes at Bruster's as well. I liked the idea of the flower pot. I always make mine in a 9×13 pan because the boys like to decorate the top with all manner of gummie creepy crawlies. They never want any flowers because they say it is too girly. Glad your daughter enjoyed her birthday party. I LOVE Dirt Cake! I was just telling Josh about it last week. He has never had one! We had this alot as kids – it was such a special treat. Yours looks fabulous! You can't go wrong with dirt cake! Looks yummy! I have yet to make a dirt cake, but I'm sure my 3 kiddos would LOVE it. Thanks for doing Tasty Tuesday. I love coming every Tuesday do find some new recipes to try with my family. Blessings! What fun!!! And, yes… Isn't God so good to do the big AND the little things for us??? Blessings to all of you – I'll be back to catch up on your posts and the awesome recipes. This is fun and delicious! When teaching 4H kids about soil every spring, we have them make "dirt." Crumbled Oreos, chocolate pudding, vanilla pudding, sprinkles, and gummy worms – these represent the different soil horizons – and they LOVE making (layering) it in their own see-through cup. Dirt cake is a fun idea for a kid's party. Who doesn't like oreos? Yum! Wow! That looks great! I bet my youngest son would love that for his next birthday! That looks like great fun! Thanks for hosting! I love dirt cake as much as the kids! Thank you for posting it! Your pictures are beautiful. What a fun and cute idea. I've never heard of a dirt cake, but have heard of baking cakes in mugs and flower pots. Are the oreo cookies you crumble the ones with the cream inside? I would think the cream would make it a bit sticky and not crumbly? Are there other kinds of oreos? Looks yummy! Great deal too! Your daughter looks like she really enjoyed her party!! So love that God DOES care about the details. Looks like Little Miss had a wonderful, dirty birthday. My kids would LOVE this cake. Maybe for a fall party I will do this! Hey, Jen, I love dirt cake & remember marveling the first time I saw it served in a flower pot like this. Fun! Jen, this is brilliant! The children are darling as always. Thanks for sharing. And yesterday, my couponing with great! Thanks! We used to make this at a preschool where I used to teach. The kids always loved it!! And, I love a good deal, too. I recently started a blog carnival – Slightly Indulgent Mondays – everyone is more than welcome to participate. Please come by – there is a fabulous give-away each week, too. I love this simple idea. I can tell that your daughter thought it was really special. 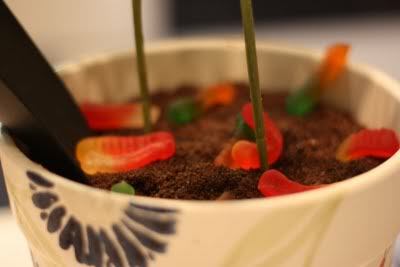 I love dirt cake minus the gummy worms…a little too much and that's the reason I don't make it. I'd eat the whole thing! So glad everything worked out well for your daughter's cake, even if the improvisation had it's moments. it's hard not to eat the whole bucket, isn't it? Jen, love this one, and the pictures are priceless. This has been a favorite with my kids for birthdays. I just came to your site from Pioneer Woman's blog. I am loving looking around here! I also have done speaking a churchs and am currently employed full time as the weekend service producer at our church. This weekend I am doing a drama at our womans conference written by Nicole Johnson – I saw you had a video of you doing one of hers too! I am deemed "The Fashionista" at work, and never pay retail price for anything. Definitely feeling some things in common with you! I've only had dirt cake once in my life but I still have the recipe that person gave me (and that was about 20 years ago)! Great testament to everything coming together and the moment being about her smiles! How cute! This looks like a fun activity too. What is the current record for most recipes linked? Have you hit 100 yet? Love this event and love that so many moms are heading back to the kitchen. Absolutely LOVE it! Can't wait to try it out sometime. I have never heard of Dirt Cake and now I MUST make it for my critter loving daughter. I am so inspired ! Thanks for sharing. I really enjoy your blog. I grabed your button for my blog. I have seen a receipe like your dirty cake when my daughterwas in pre school. Hey Jen. Thanks so much for doing Tasty Tuesday each week. I try so hard to get out of the recipe rut and I always get such great ideas from the posts. BTW, I made my first dirt cake for Carson's birthday a few weeks ago. He got a huge kick out of it…a yummy memory made! I make dirt cake for my husband! Well, my recipe is a lot simpler, and around here we just call it dirt dessert. But basically the same thing. 🙂 I love the photo with the great big smile on your daughter's face.